In this post I would like to share with you my thoughts and ideas behind mouse selection. This is important technique for any interactive apps. Using selection/feedback mode in OpenGL. Since OGL3.0 this feature is deprecated. I suggest not using it. Using color coding: render objects in different color and then read color from framebuffer render mouse position. Using mouse Ray. We cast a ray from the mouse position and we test what objects in the scene are hit. In this post I will write about that method. Read more to find how to create such application! We would like to create a ray, starting in mouse position at the near plane. Then we will test what objects collide with the ray. window Z pos - we would like to have a ray that travels through the whole scene. We can use z values from near and far plane (since everything outside those planes are clipped). It is quite simple: for the near plane z value is 0.0, and for the far plane z value is 1.0. See the code below for more explanation. output: objX, objY, objZ - calculated mouse position in the scene. TODO: gluUnProject is deprecated. But it can be easily replaced by the glm lib for instance. NOTE: instead of glGet* we can provide custom matrices, from our own math lib, like GLM. As you can see we use gluUnProject two times: one for the starting point (on the near plane), and the second time for the end point of the ray (on the far plane). 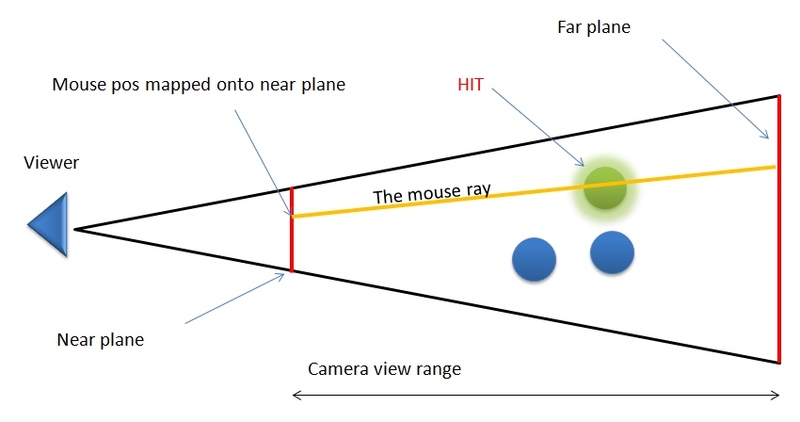 What we have right now is the mouse ray and a bunch of objects in the scene that we want to check if there is a collision between them and the ray. As you can see in the picture the mouse ray hits yellow ball that is in the scene. 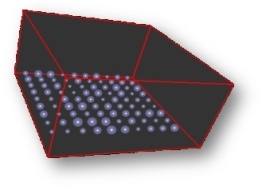 Of course testing collision between the ray and a sphere is one of the simplest cases. It is a good starting point for more advanced collision tests: with AABB (Axis Aligned Bounding Boxes), OBB (Oriented Bounding Boxes) or even arbitrary meshes. On the other hand usually we have "hierarchy" of collision tests: from simple to more advanced... so testing with spheres is usually a must-have tool. Just find the distance between the ray (3d line) and the center of the sphere. If that distance is less then the radius of the sphere then we have a hit! Basically we project the AP vector (that starts at the given point) onto the AB vector (that starts at the end of the moue ray). T is a "projection" param, it should be between 0 and 1... If the point is "outside" the range (outside space between near and far plane), T will be outside this [0, 1] range. // the same is with "pt"
Now we need to put that test in proper place. Ray calculation needs camera matrices. We can do our test in the Render function just after we set up our camera matrix. But wait...! Did I miss something? We usually have several... or several thousands of objects, how to test the collision? Let us look inside the CheckHitTestBetweenPointsInTheScene. 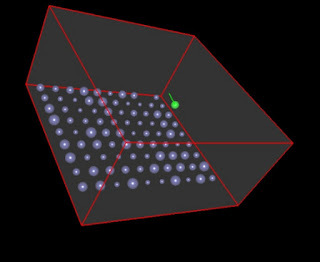 Basically it is a simple brute force solution: run through all the points (spheres), find the closest one to the mouse ray and then treat this object as a hit. 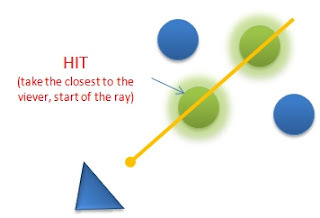 Please notice that although the ray can hit several objects, we choose only one. // can we move any ball? We process mouse buttons and when LBM is pressed and we detected a hit... then we can drag that point. Then in the Update proc we can change position of the point. Remember that we can move point only on the plane parallel to the camera front plane. We save "T" param from the hit test (from the line equation), and when we move mouse we use that "T" param to calculate new position in the 3D space. Or better way: We could use some spring system equation.. but this is your homework. 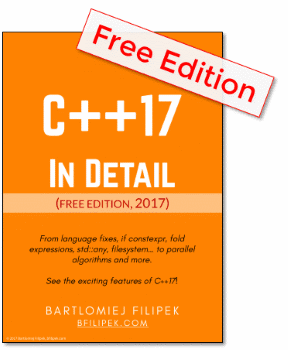 Chapter in OpenGL Development Cookbook about "Viewing and Object Picking"